In the swim – history of the North Melbourne pool. Built in 1909 as the North Melbourne Baths, the pool sits daintily at the intersection of Macaulay Road and Arden Street, nestled among industrial buildings and sports fields. It is now officially part of the North Melbourne Recreation Centre. 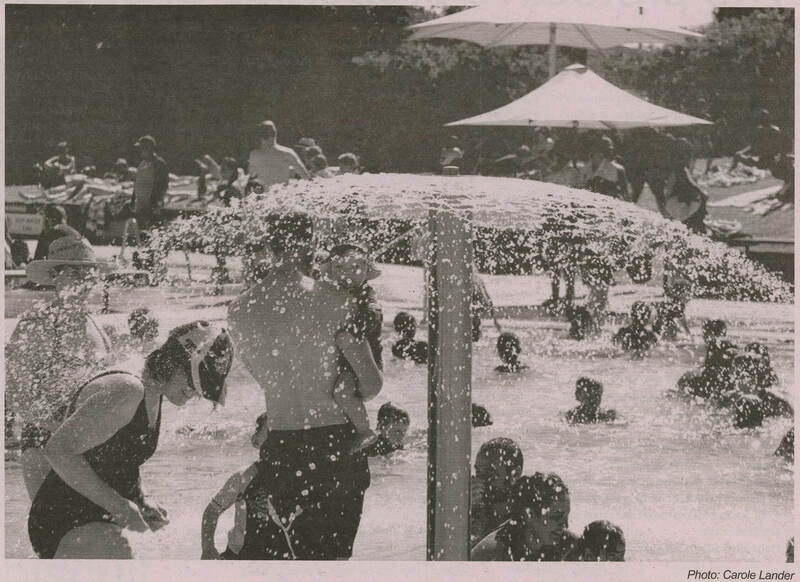 Memoirs from early users fondly recall long days spent at the pool during Melbourne's hot summers. Not much has changed. In the heatwave week of 13-17 January this year, a total of 8,300 people went to the centre to cool off. For the first 30 years, swimming was segregated and the men had the lion's share. Females were only allowed 10 hours over two days of the week. Similarly in ancient Greece it was the men who were devoted bathers. They loved to go to the gymnasium and work up a sweat, followed by a communal bath. Later, the Romans developed the art of languorous bathing and invented taps and aqueducts that made it all possible. To them, the baths were more than a place to get clean; they provided a social life as well. People from all classes of society used them, but only the men. In Europe during the Middle Ages the spread of plague made people consider more closely their attitude to hygiene but they went in the opposite direction — plugging their pores rather than cleansing them with water. In the 1500s the English towns of Bath and Buxton gained popularity as spas when royalty visited to cure their gout. Coastal towns claimed that the really curative waters were those of the sea and Brighton became the most fashionable resort in the world. By the early 1900s bathrooms were appearing in the homes of the wealthy and here in Australia, public swimming pools were being proposed in many towns and cities. At the opening of the North Melbourne Baths, the premier, Mr Murray, urged the necessity of children knowing how to swim. "Swimming should be made a compulsory subject in state schools," he said in his address. Swimming lessons don't feature in all the memoirs and often bathers just enjoyed playing in the water to keep cool. For those who did learn, there was a Herald Certificate to strive for. In 1950, Yvonne Lord was taught to swim by her father and proudly came third in the Under 11 Freestyle, which was won by Dawn Fraser. Also in the 1950’s, Anthona Wall remembers that the water was freezing and the weather often cold when she went for swimming lessons with St Michael's School. "I was frightened of deep water. I never could swim the length but eventually I could swim the width of the pool. I never got in at the deep end," she said. In the 1960’s Siobhan Hannan recalls that "there were no swimming lanes or lessons, none of the stuff pools have these days." And by the 1980’s the pool was showing all the signs of age and was leaking. It closed in 1991 and might have stayed that way if local people had not organised a campaign for a new one, which opened in 1996. Well, there are certainly plenty of swimming facilities there today. Pools for infants and toddlers are shaded and safe. The 25-metre, eight-lane baths provides ample opportunities for swimmers of all capabilities and lessons are available for all ages. The grass verges are tastefully landscaped and shaded, making this one of Melbourne's most attractive pools. To cap this off, the change-rooms had a recent makeover and are a joy to use. The Victorian school curriculum stipulates physical aquatic activity and all the North Melbourne schools visit this local pool for lessons. Organisations like Austswim focus on survival in swimming lessons. Australians are obsessed with staying safe around water, but there is another dimension to swimming — fitness. No other workout burns calories, boosts metabolism, and firms every muscle in the body (without putting stress on joints) better than a swimming workout. Fitness trainers point out that people who are keen to lose weight can burn around 500 calories an hour in an easy swim, while a vigorous effort can get rid of almost 700. Because water is nearly 800 times denser than air, each kick, push and pull is like a mini resistance workout for the entire body especially core, hips, arms, shoulders and glutes. So in addition to blasting calories as we swim, we build lean muscle, which ignites our metabolism so that we burn more calories. Swimming is kind to the body. Water neutralises gravity, so we become virtually weightless when immersed, giving our joints a rest. People suffering with arthritis are often advised to go to a pool and the North Melbourne Baths offer low impact water aerobics classes. The ABC Health and Wellbeing website (www.abc.net.au/health/healthyliving/fitness/ exerciseguide/stories/2007/06/05/ 1943162 .ht) is a good source of information on this topic. It lists cardio-respiratory fitness and flexibility as further benefits gained from swimming. The North Melbourne Pool will close for winter on 30th of April but there is still time to get on down and start your fitness program. And if you get hooked, you can continue at the covered public pools in the vicinity.